Although economic growth is slowing, the business environment is generally stable. The challenge for the Chinese authorities is to implement reforms to reduce the vulnerabilities in the economy. Overall, the domestic political situation in China is stable, with the Chinese Communist Party (CCP) firmly in power. President Xi Jinping continues to consolidate his power within the CCP and is seen as the most powerful Chinese leader since Deng Xiaoping. The government under Xi has launched a campaign against corruption and extravagance by top party officials, leading to the conviction last year on corruption charges of Bo Xilai, a former Politburo member and Communist Party Secretary of the city of Chongqing. In July this year it was announced that Zhou Yongkang, a former top senior leader and head of the security apparatus was also investigated for corruption. President Xi is apparently breaching a long-standing tacit agreement that most CCP senior officials would enjoy immunity from disciplinary charges. This could increase tensions within the CCP ranks. To prevent any major social unrest, the administration’s main aim is to preserve high economic growth, create jobs and develop a public welfare safety net. While it has become more difficult to prevent public demonstrations and criticism of the government (via the internet), internal stability is strengthened by the fact that the living standards of many Chinese people have improved: GDP per capita has risen from US$ 847 in 2000 to US$ 7,645 in 2014. Nevertheless, there is considerable income disparity between the rural and the urban population, and between the coastal provinces and western parts of the country. In recent years, there has been growing social discontent in several provinces, fuelled by corruption in local government, environmental problems and weak protection of property and land rights. In many cases, farmland has been illicitly expropriated by the local authorities for commercial use. So far protests have flared up only locally and have been swiftly contained by the security forces. While the recent pro-democracy protests in Hong Kong pose a challenge for the Chinese authorities, it is not expected that they will spill over into mainland China. Sino-US relations are generally stable, despite some regularly emerging tensions over US arms sales to Taiwan and human rights issues. However, Washington has become increasingly concerned about Beijing’s military build-up: especially the potential for China’s naval and air force to strengthen their power projection in the Pacific. A shift in US defence strategy, with a renewed focus on Asia-Pacific, is motivated mainly by Washington’s aim to balance rising Chinese power in the region. One issue is Beijing’s increasing assertiveness in the South China Sea, where it claims sovereignty over a large U-shaped area. This has brought it into dispute with several neighbouring countries. Since 2013, tensions with the Philippines and Vietnam, over disputed islands in that area, have increased sharply again. Relations with Japan have deteriorated since 2012 over the Senkaku/Diaoyu islands claimed by both sides. Regular incursions by Chinese ships into Japanese-claimed territorial waters around the islands have increased the danger of a clash. The main challenge: rebalancing the economy In recent years, China’s economic growth has been heavily reliant on investment, which, as a share of GDP, has risen above 50%, fuelling the expansion of housing stock, local infrastructure and manufacturing capacity. Together with a massive credit expansion since 2008/2009, inefficient investments have created bubbles in the property market and led to high debt levels for businesses and local governments. China’s administration has repeatedly emphasised that the government is ready to accept slower growth as it rebalances away from an investment-driven, export-dependent, economy to a more services-oriented and consumption-driven one. On the supply side the government wants to generate more innovation and productivity growth while curbing wasteful investment. On the demand side it strives to increase household incomes and consumption to create a more sustainable balance between consumption and investment. China’s economic growth continues to slow as the efforts of the authorities to curb credit and investment growth begin to take effect. In Q3 of 2014, GDP growth slowed to 7.3% from 7.5% in Q2, while the average growth rate in Q1-Q3 has been 7.4%. For the whole year, GDP is expected to grow 7.3% - the slowest annual growth rate since 1999 - meaning that the government would marginally miss its target of 7.5%. 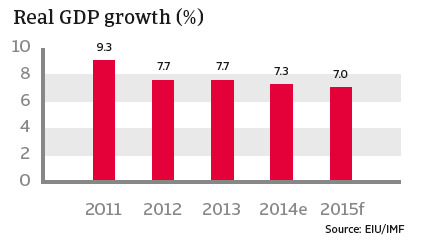 Mainly because of lower investment growth, the Chinese economy is expected to grow by ‘just’ 7.0 % in 2015. Some targeted stimulus measures have been introduced to bolster the economic slowdown seen in early 2014. Government spending on infrastructure, railways and social housing has been increased. Monetary easing measures to support small and medium-sized businesses (SMEs) and the agricultural sector have been introduced, with tax relief for SMEs and some control on property sales relaxed to support the weak property sector. 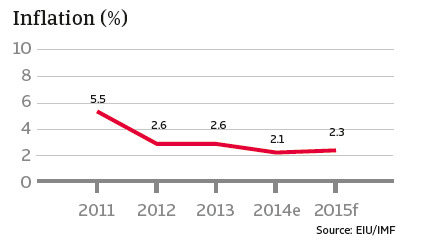 Because of earlier tightening of monetary policy, inflation has fallen since late 2011 and is now expected to be 2.1% this year, after 2.6% in 2013. This modest inflation means that the central bank, the People‘s Bank of China (PBOC), has room for monetary policy easing if necessary. End of November 2014 the PBOC decided to cut the benchmark interest rate for the first time since July 2012, by 40 basis points to 5.60%, in order to reduce financing costs for (smaller) Chinese businesses as growth slows down. 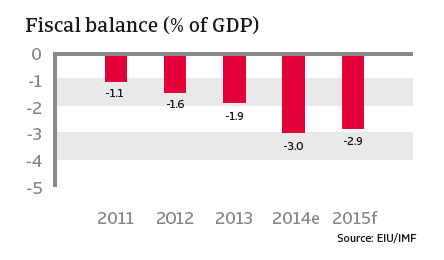 China’s budget deficit has increased, as spending on social welfare services rises, but remains relatively low at about 3% of GDP in 2014 with the same rate expected in 2015. However, the debts of local government and the banking sector remain contingent liabilities for central government. Public debt is currently moderate but, when contingent liabilities such as bank restructuring in the event of deterioration in the financial sector and future pension and social security costs are taken into account, that debt becomes much higher. Although China is by no means immune to weaker external demand, the main risks to future growth come from the internal market. The reining in of credit growth and shadow banking activities is necessary as the investment boom since 2008, accompanied by high credit growth, has led to high debt levels for both local government and business. According to the IMF, total social financing, a broad measure of credit, has increased from 127% of GDP in 2008 to 207% of GDP at the beginning of 2014, leading to a highly leveraged economy. Overall, debt-to-GDP amounts to 235% of GDP. The quick pace of the increase since 2008 (72% debt-to-GDP) is very unusual and comes at the costs of inefficient use of resources, resulting in overcapacity in several sectors. The financial vulnerabilities visible in the financial, corporate, and real estate sectors and in local government are interconnected, so that a shock in one sector could lead to a chain reaction in another. The situation in the property market is particularly critical. A major concern is that the perceived property overvaluation may be subject to sharp correction. Moreover, investment in real estate has been a major driver of economic growth and a sharp price correction would have an impact on the whole economy via the banking sector and local governments. 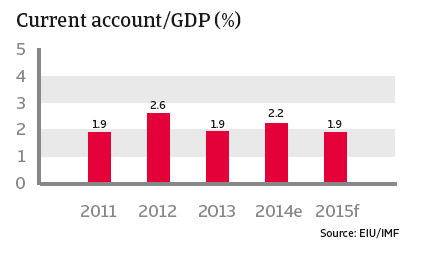 The Chinese banking sector remains weak, as high credit growth in previous years could lead to deteriorating asset quality in the financial sector. Problems in the banking sector could spill over into the broader economy or even lead to the need for state intervention to prop up the financial system. Although non-performing bank loans are currently low (1%), this percentage will inevitably rise in the medium term. Many loans have been rolled over instead of being repaid and the questionable quality of assets in the banking sector is worrying. An important source of the massive expansion of lending has been ’shadow banks‘ whose off balance sheet activities have risen due to the heavy regulation of the financial system. With no precise data available on shadow banking activities, the risks to the economy are difficult to assess. However, most activity is linked to the real estate sector, and there are concerns about the banks ́ large exposure to the property market. Therefore the Chinese authorities have already introduced measures to curb shadow banking activities, resulting in lower credit growth. Closely interlinked with potential banking sector problems are the finances of local government bodies, which played an important role in the massive stimulus policy of 2008 and 2009. The debt burden of local governments has increased due to high investment in infrastructure and real estate, financed through borrowing by local government financing vehicles, often via the shadow banking sector. There is considerable uncertainty about the quality of these investments and, at the end of 2013, a national audit revealed that local government debt amounted to 32% of GDP, creating worries about local governments ́ financial health. As in most cases, land or real estate is collateral for the loans. The situation in the real estate sector is important for their quality but also for the repayment capacity of local governments, as one third of revenues are from land sales. Any severe downward correction in the property market could make funding difficult and would hurt the banking sector as major creditors. At 152% of GDP, Chinese companies are highly leveraged. As the property sector has been the engine of growth since 2008, real estate business and companies in related industries like construction are especially highly indebted. State-owned enterprises in particular have also seen their leverage ratio rising in recent years. However private companies outside the real estate or construction sector have deleveraged since 2008. Structure: The short-term debt share is 66% in 2014, but is wholly covered by reserves. Remarks: Debt has increased rapidly since 2009: especially short-term debt (trade credit and trade financing). 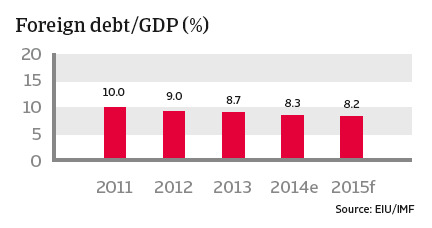 However, the debt ratio as a percentage of GDP is still good. The country holds enormous foreign reserves (see below) and its solvency and liquidity are sound, with ample capacity to make external payments. Remarks: With imports increasing, the current account surplus has decreased over the last couple of years, and this will continue in 2015, as private consumption rises. In months of imports (cif): China has the largest foreign exchange reserves of any country, due to its strong balance of payments: 24 months of import cover in 2014. The challenge for the Chinese authorities is to implement reforms to reduce the vulnerabilities in the economy and to rebalance economic growth in the medium term without overly slowing economic growth. While the forecast slowdown in economic growth is expected to result in repayment difficulties for highly leveraged companies and increasing defaults, the authorities would step in if increasing defaults created a risk to financial stability. At the same time, the government is expected to continue taking targeted stimulus measures to prevent a sharp deceleration in growth. The labour market situation is crucial in this respect, as generating enough jobs is vital to preventing social unrest. However, continued reliance on government support and stimulus measures could also aggravate the vulnerabilities in the economy and thereby increase the risk of a further economic slowdown. Although economic growth is slowing, the Chinese business environment remains generally stable. However, some sectors - especially steel, textile, paper, shipbuilding, shipping, coal and solar - are facing problems, due mainly to overcapacity, pressure on working capital and lack of credit. Listed companies, state-owned businesses and foreign-owned enterprises are generally performing well, thanks to stronger support from banks and shareholders. More caution is recommended when dealing with small and medium-sized private businesses, as many of them - even those active in well-performing industries - often suffer from limited financing facilities. Consumption will decrease as the government introduces measures to cool the bubble in the residential property market. 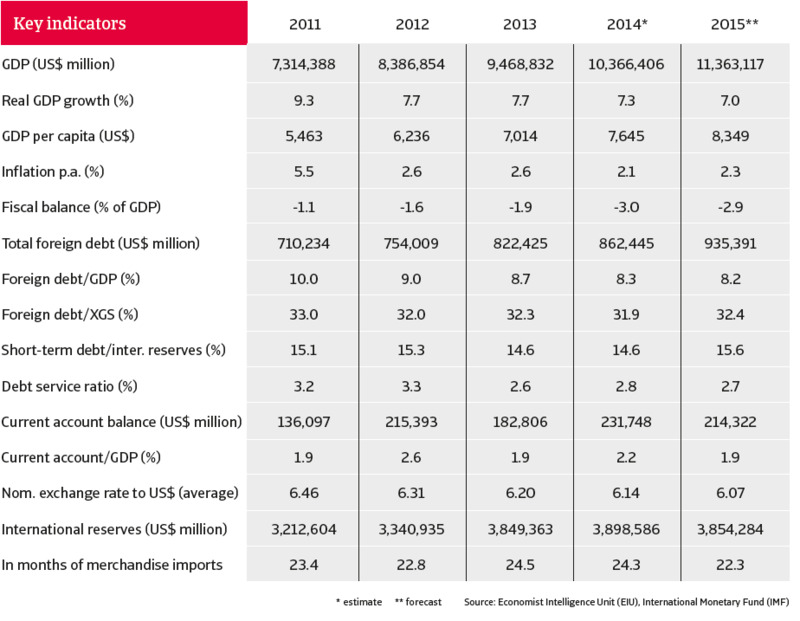 China ́s electronic machinery sector performed well in 2013 and 2014 with sales increasing year-on-year. Lower growth in IT spending due to lower overall growth and market fluctuations. China ́s electronics/ICT sector is still expected to outperform regionally and globally, in view of the size of the population, rising incomes, the relatively low penetration of products and a supportive policy environment. China is the world‘s largest coal user, producer and importer: coal-fired thermal power dominates China’s electricity production. However, this will change in the coming years because of measures to reduce air pollution and the expected slowdown in economic growth. Overcapacity is a serious problem, created by over-investment in the sector. Decreasing coal prices led to steep falls in the net profits of large and medium sized coal producers in 2013/14. The market is not expected to rebound in the short term. China remains the world’s largest steel producer. Overcapacity and huge stockpiles are still major challenges and the main reasons for the continuing deterioration in this industry. Steel producers ́ margins continue to fall as a result. Financing in the steel sector has become harder, as banks reduce loans because of increasing bad debts and the worsening market outlook. China is one of the world’s top five drug markets in terms of overall size. It remains a key emerging market for multinational pharmaceutical firms, with double-digit sales growth rates. As spending on medical services increases, spending on pharmaceuticals in China is expected to continue to growth significantly in the coming years. The pharmaceuticals distribution sector has been consolidating in recent years. 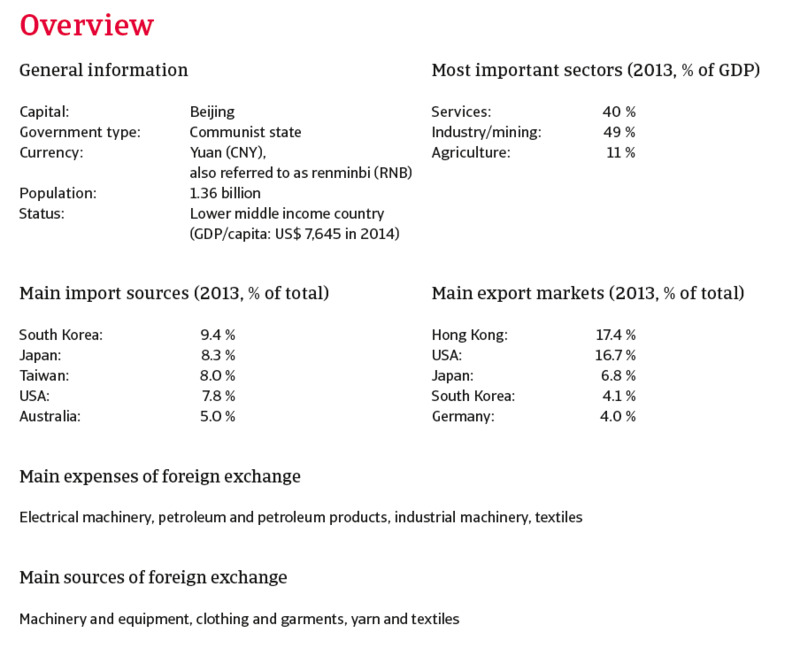 Chinese textile companies are less competitive than those in Europe and other Asian countries such as Bangladesh, Vietnam, India and Cambodia because of rising labour costs, renminbi appreciation and expensive domestic cotton price. Although China‘s textile industry is facing the challenges of shrinking market share and decreasing growth, it is expected to show a reasonable performance in 2014. There is still steady growth in domestic consumption and external demand. China will therefore remain the leading textile and apparel sourcing country for the time being.